Sam fixed my hair after a bad colour (done elsewhere!). It looks a thousand times better - Sam always gets it right! Love my new hair, super friendly and welcoming hairdresser. No longer scared of visiting the hairdressers! Been here for the fist time. Really pleased with my haircut and the service received. Once again great haircut from Samuel, never disappointed. Samuel always greets me with a lovely warm smile, just like all the staff. I can not speak high enough in respect of Amy and Alex, they are helpful,professional and put me at ease. I am beyond happy with the service I received today. Really great. Listened to my concerns and gave a brilliant cut. Had fantastic exerience.Alex is very friendly and immediately made me feel at ease. Brilliant job from Amy as usual. Very happy with my hair and customer experience. Leah is just wonderful. Extremely talented and always gets my colour perfect. I wouldn’t use anybody else to colour my hair. We are very lucky to have her in Norwich. Thank you for taking the time to leave a review, we are glad you always have a great experience and love your hair by Leah, we look forward to seeing you again soon. My first appointment. 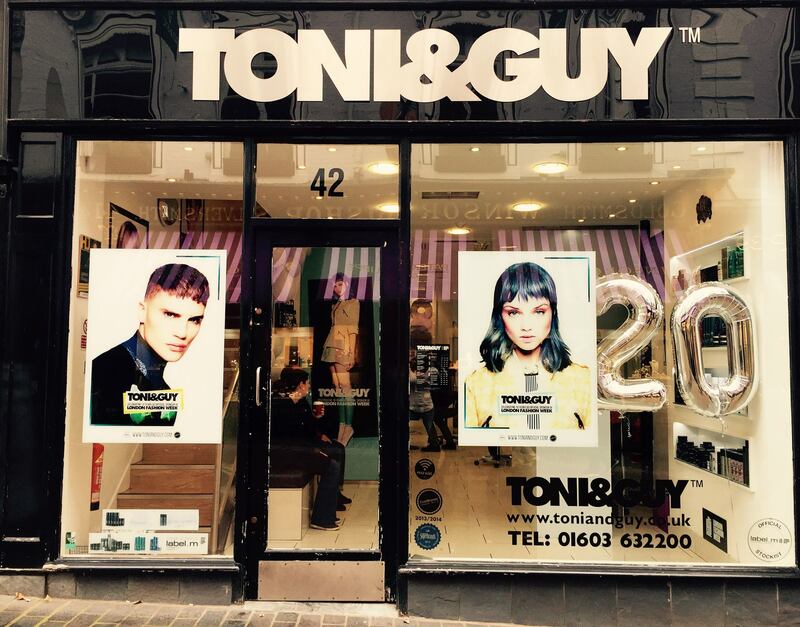 with Toni and Guy Norwich. Very impressed with Sam, he took the time to listen to what I wanted and despite the strong winds and rain when I got home my husband said” what a great haircut” ! Thank you for taking the time to leave a review, we are glad you had a great experience with Sam and love your hair, we look forward to seeing you again soon. Thank you for taking the time to leave a 5* review, we look forward to seeing you again soon. Sam was fabulous - hair colour looks and the treatment has made it feel amazing. The whole salon experience was great, always being offered drinks and all staff friendly. Plus Alex did such a great cut on my hair! Great experience from start to finish, want to come back sooner than 10-12 weeks for new highlights. Thank you so much everyone. Thank you for taking the time to leave a review, we are glad you had a great experience with Sam and Alex and love your hair, we look forward to seeing you again soon. Very good haircut and a friendly stylist! Thank you for taking the time to leave a review, we are glad you had a great experience and love your hair, we look forward to seeing you again soon. I’m incredibly happy with the haircut I got from Sam, it’s the first time he’s cut my hair and he listened to what I wanted and the result is perfect. Thank you for taking the time to leave a review, we are glad you had a great experience with Sam! we look forward to seeing you again soon. Gorgeous cut, only took 40mins! Thank you for your feedback, we are glad you had a great experience and loved your hair, just to let you know we do 15% off all services on a Tuesday!